On Friday, Chinese President Xi Jinping congratulated an American professor for publishing a book about China. 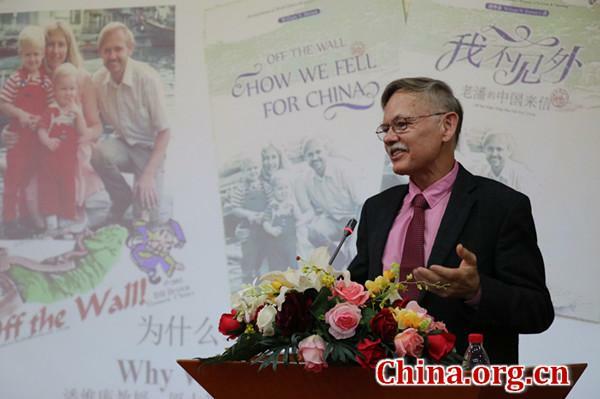 The book, "Off the Wall – How We Fell for China," written by Dr. William N. Brown, a business professor of southern China's Xiamen University, is compiled of roughly 50 letters detailing his life in Xiamen, which he sent back home to his family and friends in the United States. Upon completing the book, he sent a copy to President Xi Jinping and was surprised to receive a reply. "I have received your letter and your book. Congratulations on your new book." Xi replied in a letter to Dr. Brown, "Xiamen is an amazing city. It is now your second hometown. I used to work there, and that experience has given me many wonderful memories. You have been a teacher in Xiamen University for 30 years and dedicated precious time of your life to China's education. I am very moved by your affection to Xiamen and China." Dr. Brown moved to south China's Fujian province from the U.S. with his wife and sons in 1988, a decade after the implementation of China's reform and opening-up policy. Having worked at Xiamen University for 30 years, Dr. Brown is often locally referred to as the city's most famous foreigner. In 1992, he became Fujian province's first foreigner to receive permanent residency. An honorary citizen of the province, he has helped 13 Chinese cities, including Xiamen and neighboring Quanzhou, win the International Livable Communities Competition. His book, published by Foreign Languages Press affiliated to China International Publishing Group (CIPG), contains many amusing and touching stories that have happened throughout his time in China. One particularly humorous letter details Dr. Brown's difficulties in managing to buy a turkey for thanksgiving in 1989, despite no turkeys being sold in Xiamen back then. "As an eyewitness to China's reform and opening-up, you have represented Xiamen and Fujian province, and painted a real picture of China for the world. I really appreciate your attitude of integrating into the Chinese community," Xi said in his letter to Dr. Brown, "You said in the letter that you are optimistic about China's future. I am also confident that you will see a better and more prosperous China that will bring even more benefits to the world and humanity, and therefore the Chinese stories you tell in the future will be even more wonderful." "I am very surprised yet very happy and honored to get a reply from President Xi. Despite shouldering the huge responsibility and pressure of being the president of a country with the largest population in the world, he still managed to write back to an ordinary foreign teacher like me," Dr. Brown told China.org.cn, "I am more than willing to witness China's development in the following decades." "With a state leader like Xi, the Chinese dream will surely come true and set an excellent example for the world." Dr. Brown added.